The population of Roman London held an enormous number of different religious beliefs and immigrants and soldiers from different parts of the Empire bought with them their own deities and beliefs alongside the beliefs of the native Britons, and soldiers and traders from Celtic France and Germany. There is archaeological evidence for the worship of classical gods from Rome, deities from the Near East and beliefs that are similar to those found in Britain during the Iron Age. A lot of evidence for the public worship of Classical Roman gods, such as Jupiter, Juno and Minerva has been found in London. Official buildings normally contained or displayed statues to the gods and emperors. A small temple was found to the west of the 2nd-century forum/basilica, although archaeologists are not sure which god, or gods, were worshiped there. The rebuilding of a temple of Jupiter is mentioned in an inscription on an altar found in the south west of the town during excavations of the riverside wall at Baynard’s Castle. Two altars, one dedicated to Jupiter, and the remains of an arch were found, along with a screen of deities depicting Mars, Diana, Minerva, Vulcan and Mercury. Mithraism was an exclusive Roman religion practised in the 1st – 4th centuries and it is thought that it was only open to men. It is usually called a ‘mystery cult’, as the rituals and activities of the religion were kept a secret, but what we do know about how they worshipped suggests that the religion promised an afterlife and forgave sinful behaviour, similar to Christianity. There is no record of a religious book for Mithraism, like the Christian bible. Evidence for the religion comes mostly from inscriptions, dedications and archaeological remains. It developed in the Roman Empire, although many historians and archaeologists think that it may have earlier Persian or Indian origins. The place of worship is known as a ‘mithraeum’ which was built to look like a natural cave. Sometimes temples were built specifically for the purpose, but often they were single rooms in larger buildings used for something else. The Temple of Mithras Walbrook a temple of Mithras discovered by archaeologists in 1954 in the City of London. It was built sometime in the mid-3rd century and was later used for the worship of another god in the early 4th century. The archaeologists working on site found a number of carefully buried statues including the head of Mithras, who was identified by his Phrygian cap. 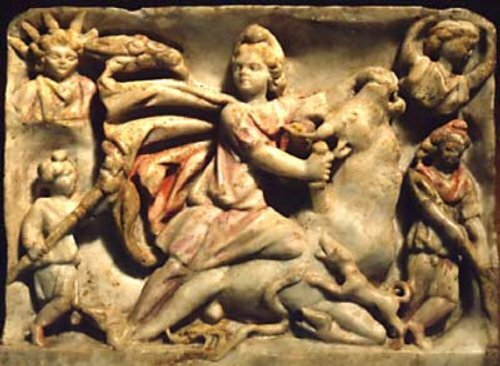 It also included a relief of Mithras slaying the astral bull, called the Tauroctony, the central part of Mithraic beliefs, illustrating the moment at which Mithras released the blood of the astral bull that contained the essence of life. The Roman army stationed in Britain regularly contained Egyptian recruits, and many of the units had been stationed in Egypt on duty as well – although the cult of Isis was already a popular religion in the Empire. Worship of the Egyptian mother goddess Isis is known to have taken place as early as the 1st century in Londinium, from an inscription on a flagon found in Southwark that means “London, at the Temple of Isis”. An altar was found built into the riverside wall, naming Marcus Martiannius Pulcher commemorating the rebuidling of a temple to Isis, possibly in the third century. A bone hairpin found in the city over 60 years ago that shows Isis with a sun disc between two cows horns on her head, and a bronze sculpture of Isis was discovered in the Temple of Mithras at Walbrook. Other Egyptian deities appear on objects found in Londinium, including two lamps depicting Anubis, an Egyptian god of the underworld found at Great Dover Street Southwark, in 1996. A set of bronze castration clamps were found in the river Thames near to London Bridge, and are decorated with images of Cybele and Atys, a Phrygian mother goddess and her lover. Cybele was a popular fertility/mother goddess in the Roman Empire, and her priests, or Galli, dedicated themselves to her by castrating themselves ritually – and the Empire was apparently rewarded by increased fertility. The clamps may have instead been used to castrate animals, since it is also decorated with bulls and mules. Not all religious practises took place in temples or shrines. Household shrines would have been common, and small statues of Lares and Penates, the protectors of hearth and home have been found in Londinium. Wealthier properties in Roman Britain had wall paintings and floor mosaics of gods. Romans also believed that spirits called genii were everywhere, that needed to be given offerings. They were often seen to overlook junctions an dboundaries, as well as buildings, people and animals. A statue of a genius was found under Southwark Cathedral in 1977. There is very little evidence for Christianity in early Roman Britain as a whole. Documentary evidence exists for a Chritian community in London, with a bishop of London. Archaeological evidence includes the presence of the Chi-Rho symbol on the base of a pewter bowl. There may have been an early church found in 1989 near to Pepys Street , although archaeologists cannot be sure.